Explore my favourite top picks from the current Joules bedding collections, with designs including Harbour, Whitstable, Dahlia and Mono Blossom. Joules are renowned for their heritage inspired hand-drawn and hand-painted designs, combined with a contemporary and often colourful twist. Dahlia is a refreshing off-white design featuring a cheery pink, white and grey hand-painted floral pattern across narrow light grey stripes. The pattern is large but spacious and is backed with a contrasting spot print design on the reverse. 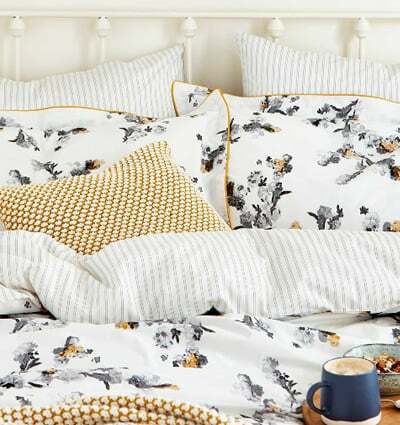 The main design is available as a duvet cover with matching housewife and Oxford pillowcases, while the contrasting grey spot design is available as standard housewife pillowcases. A perfect complement to light coloured bedrooms, this Joules bedding design features a large, bold, white, hand-painted poppies pattern against a dark navy background. Each poppy is tinged with pink edges and, additionally, offset by the delicate pastel green of the stems and leaves. Painted Poppy is available as a duvet cover and matching pillowcases. The duvet cover boasts a more intricate contrasting floral pattern on the reverse, which is also available as standard pillowcases. Whitstable is a classic, vintage inspired hand-drawn floral design, which has been treated to a more contemporary refresh and feel. The bold pattern uses a mixture of gentle whites, pinks and blues, while the bright yellow background provides an instant feeling of summer. This is especially true when displayed with the contrasting pastel coloured check pattern on the reverse. The main design is available as a duvet and matching pillowcases, while the contrasting check pillowcases are also available separately. Harbour – also known as White Whitstable – uses a scaled-down version of the floral pattern found on the Yellow Whitstable design, but against a more nautical tinged light grey and white striped background. The reverse of the duvet cover features a similar stripe pattern, which is also decorated with a smattering of colourful spots. Matching pillowcases are available in both patterns, as well as complementary cushions and throws to complete the collection. If you’re looking to create a nautical theme in your bedroom this year, you’ll almost certainly be wanting a key statement piece to build the rest of the room around, and Galley Grade from the Joules bedding collection could be just the focal piece you need. This design makes use of bold navy and white stripes, as well as a splash of red thrown in for good measure. The pattern on the reverse of the duvet, as well as the contrasting pillowcases, is a cute little geometric sailing boats design, helping you to feel ‘all at sea’. Furthermore, the Galley Grade range also includes an adorable duck cushion and a contrasting striped throw. Neeson is very much a classic country house style design, due to its understated check pattern formed of navy, light blue and red stripes against a soft grey backing. The contrast pattern on the reverse is a simple and sparse polka-dot design using the same colour palette, therefore complimenting the main design beautifully. Both the main design and contrast design are also available as matching pillowcases. And finally, this beautiful, contemporary Joules bedding design will brighten and refresh your bedroom with ease. Pops of vivid yellow on the floral pattern, and also the contrast piping, really help to bring the charcoal and grey water-colour design to life. The Mono Blossom design is very detailed, but not overpowering, with plenty of crisp, plain white background to break the pattern up. The contrasting reverse pattern is a simple but classy grey and white stripe design.